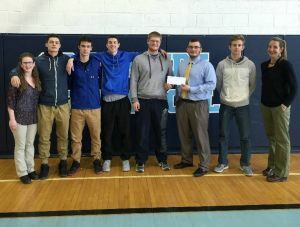 Camden, ME – February 25, 2016 – Camden National Bank is ensuring that more than 1,600 Maine students will be cheering on their home team at the 2016 State Basketball Championship games on February 26th and 27th. This marks the seventh year that the bank has partnered with local schools to purchase tickets for students and, in some cases, help with transportation to the championship games. The bank first provided free student tickets in 2010 at the suggestion of an employee who recognized the need when she was in high school and wished that someone had stepped in to ensure that all students, regardless of their personal situation, could attend the state tournaments. Every year, schools across the state have echoed this need and expressed their appreciation for this support. Camden National Corporation is the holding company of Camden National Bank and Acadia Trust, N.A. Headquartered in Camden, Maine, Camden National Corporation has $3.7 billion in assets and is the largest publicly traded company in Northern New England (NASDAQ: CAC). Camden National Bank is a full-service community bank that employs over 700 people, features a network of 64 banking centers and 85 ATMs in Maine, and offers state-of-the-art online and mobile banking resources as well as brokerage and insurance services through its division, Camden Financial Consultants. Acadia Trust offers investment management and fiduciary services through its offices in Portland, Bangor and Ellsworth. To learn more, visit www.CamdenNational.com. 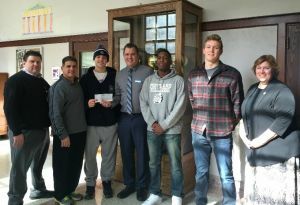 Photo caption: Camden National Bank employees present donations to students and school representatives at Portland High School (top) and Oceanside High School East (bottom).